London Stone is now approximately eighteen meters from its probable, original, Roman location having moved at least six times since its foundation. It is also six metres above Roman street level, a datum coinciding almost exactly with the floors of the underground trains passing directly below (Fig.1). Fig.1: Chimaeric reconstruction of London Stone. [detail 1]. 2011-2013. By the time of its first written mention in the early tenth or possibly early, but more likely late, twelfth-century in connection with either Æthelstan, King of England or Henry Fitz Ailwin, the first mayor of London, respectively, (Clark 2015, 14-16) it had found itself surrounded on all sides by the ever-widening Cannon Street. A hazard to traffic, the Stone was first encased in the seventeenth-century. Burned and reduced in the Great Fire it was moved, and moved again, bombed and then moved twice more, ultimately to be put behind glass and grille. Temporarily on display at the Museum of London it currently awaits a return to a new building at 111 Cannon Street. Over the centuries a loose and largely oral collection of folkloric fragments began to cleave to it, culminating in 1882 with what became a much repeated mythic fabrication tying the fate of the Stone to the fate of the City and their (Stone and city) origins in Brutus’s flight from Troy. (Clark 2007) “For many centuries it was popularly believed to be the stone of Brutus, brought by him as a deity. ‘So long as the stone of Brutus is safe,’ ran one city proverb, ‘so long shall London flourish.’” As the myths grew so the Stone gradually disappeared from view, hidden in plain sight. Forgotten and displaced, it had become, and remains, all but invisible. Fig.2: Various authors, The gradual disappearance of London Stone. Photomontage: Alessandro Zambelli. Anon., London Stone, Cannon Street with two figures [detail]. c.1700 London Metropolitan Archive. Jacob Smith, View of St. Swithin London Stone from Cannon Street [detail]. c.1700, engraving. London Metropolitan Archive. Anon., View of London Stone, Cannon Street with figure [detail]. c.1820 London Metropolitan Archive. W. Whiffin, The London Stone, St. Swithin’s, Cannon Street [detail]. 1920s, Photograph. London Metropolitan Archive. The Cannon Street Coster [Rebecca Daisy’s sweetstuff stall]. From: Anon. 1901. ‘The Cannon Street Stall-Keeper’, The Daily Graphic, 24 April. London Metropolitan Archive. Bomb damaged St Swithin’s church. 1946, Photograph. Time Life. Fin Fahey, The enclosure to London Stone, 111 Cannon Street, London, between 1962 and 2016. 2005. Digital photograph. Available from: Creative Commons, http://bit.ly/1JLC7B0 (accessed 31 December 2015). Measuring only, “21 inches wide, 17 inches high and 12 inches front to back,” (Clark 2007, 169) other than this, almost everything else we think we know about London Stone has been demonstrated by its unofficial ‘biographer,’ John Clark, to be false or, as he puts it, “since it is so difficult to prove a negative, it is perhaps fairer to say that there is no evidence to support most of this farrago of myth.” (Clark 2007, 170) These mythologies adhere to the Stone so readily, it seems to me, precisely because of its unprepossessing physical presence – a mythology which grows in proportion to the extent that the Stone itself withers away; hidden by the erosions of time, the accrual of myth and the grilled housing which surrounds it. 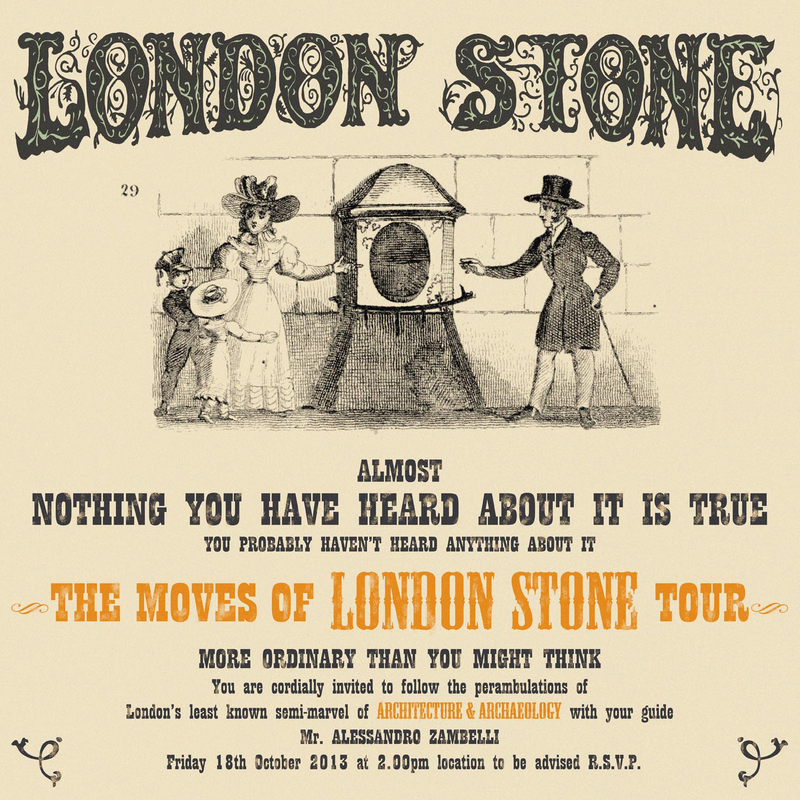 The Moves of London Stone, was a critical guided tour which I led during the afternoon of Friday, 18 October, 2013 and whose object was the bathetic re-enactment of the Stone’s on-going, imperceptibly slow (and extremely local) journey. Soft I smell: Oh pure Nose. Delio. Wat do you smell? “Lor’ love yer – yes,” said Mrs Daisy. Cade. Fling all my dead Subjects into the Thames. Now say, what place is this? London Stone Part 3: a propositional reconstruction, will follow… after some other posts. Ackroyd, Peter. 2001. London: the biography. London: Vintage. Allen, Thomas, and Thomas Wright. 1827. The History and Antiquities of London, Westminster, Southwark and parts adjacent. With engravings. 5 vols. Vol. 3. London: G. Virtue. Anon. 1708. The British Apollo, or, Curious amusements for the ingenious. To which are added the most material occurrences foreign and domestic. Perform’d by a Society of Gentlemen. [With indexes to vol. 1-3.] vol. 1. no. 1-vol. 4. no. 20. 13 Feb. 1708-11 May, 1711. London: J. Mayo, for the Authors. Anon. 1888. “London Stone.” Chambers’s Journal 5th Series. Anon. 1901. “The Cannon Street Stall-Keeper.” The Daily Graphic, 24 April. Architect, An. 1798. “Letter.” The Gentleman’s magazine 68 Part 2 (3):735-822. Blake, William. 1804. Milton. A poem, etc. [With illustrations by W. Blake. ]: pl. 45. W. Blake: [London,] 1804 [1808?]. Camden, William, and Philemon Holland. 1610. Britain, or, a Chorographicall Description of the most flourishing Kingdomes, England, Scotland, and Ireland … Written first in Latine by W. Camden … translated newly into English by Philemon Holland … Finally revised, amended, and enlarged with sundry additions, etc: Londini. Clark, John. 2007. “Jack Cade at London Stone.” Transactions of the London and Middlesex Archaeological Society 58:169-189. Clark, John. 2015. Unpublished Draft. Coughlan, Sean. 2006. “London’s heart of stone.” BBC, accessed 17th November. http://news.bbc.co.uk/1/hi/magazine/4997470.stm. Crowne, John. 2005. “The Misery of Civil War .” In Shakespeare adaptations from the Restoration : five plays, edited by Barbara A. Murray. Madison [N.J.]: Fairleigh Dickinson University Press. England, The Church Commissioners of the Church of. 1958. Confirmation of a supplementary scheme dealing with the church of Saint Swithun. Westminster, London: The Church of England. Fabyan, Robert. 1516. [The Chronicles of Fabyan.] Begin. [fol. a 1, preceded by ten leaves containing the heraldic frontispiece and the table,] Prima Pars Cronecarum. For that in the accomptynge of the yeres of the worlde, etc. End. Thus endeth the newe Cronycles of Englande and of Fraunce, etc. B.L. [London]: R. Pynson. Glapthorne, Henry. 1874. “Wit in a Constable .” In The Plays and Poems of Henry Glapthorne, now first collected with illustrative notes and a memoir of the Author [by R. H. Shepherd]. L.P, edited by Richard Herne Shepherd. 2 vol. J. Pearson: London. Halliwell-Phillipps, James Orchard. 1860 . A Treatyse of a Galaunt; with the Maryage of the fayre Pusell, the Bosse of Byllyngesgate unto London Stone. [In verse.] From the unique edition printed by Wynkyn de Worde. Edited by J. O. H: London. Haughton, William. 1616. English-Men for my Money; or, a pleasant comedy, called A Woman will have her Will. [By W. H.]. Hawthorne, Nathaniel. 1941. The English notebooks, based upon the original manuscripts in the Pierpont Morgan Library. New York: Modern Language Association of America. Irving, Washington. 1820. The Sketch Book of Geoffrey Crayon, Gent. Second edition. London: John Murray. Jones, Michael Christopher Emlyn, C. T. Allmand, John Benet, G. L. Harriss, and M. A. Harriss. 1972. The Camden miscellany. Vol. 24. London: Offices of the Royal Historical Society. Lambert, B. 1806. The history and survey of London and its environs : from the earliest period to the present time. [S.l. ]: T. Hughes. Latour, Bruno. 1999. Pandora’s Hope: essays on the reality of science studies. Cambridge, Mass. ; London: Harvard University Press. Makers, The Worshipful Company of Spectacle. 2014. “minute of 1671 records.” The Worshipful Company of Spectacle Makers, accessed 18th November. http://www.spectaclemakers.com/contact/index.htm. Merrion, Mor [Richard Williams Morgan]. 1862. “Stonehenge.” Notes and Queries 3rd Series Vol.1. Pennant, Thomas. 1793. Some Account of London. [Another edition.] Third edition. ed: London. Price, John Edward. 1870. A Description of the Roman Tessellated Pavement found in Bucklersbury : with observations on analogous discoveries. Westminster: Nichols and Sons. Robinson, Fitzroy. 1960. “St Swithun’s, London Stone.” Museum of London Archives, 25th March. Shakespeare, William. 1594. The First Part of the Contention: the first quarto, 1594. Edited by Frederick James Furnivall and Richard Grant White. London: C. Praetorius. Shakespeare, William. 1623 [reprinted 1807]. Mr William Shakespeares Comedies, Histories & Tragedies. Published According to the True Originall Copies. London: 3 pt. Isaac Iaggard and Ed. Blount. Stow, John, and John Strype. 1720. A survey of the cities of London and Westminster : containing the original, antiquity, increase, modern estate and government of those cities: London ; 1720. Stow, John, and William John Thoms. 1842 . A Survey Of London. A survey of London, written in the year 1598. A new edition, edited by William J. Thoms. ed: London. Street, C. E. 2000. Earthstars: the visionary landscape. London: Hermitage. Stukeley, William. 1717-. Commonplace Book. edited by Wiltshire Heritage Museum Wiltshire Archaeological and Natural History Society Library, Devizes. Williams Morgan, Richard [RWM]. 1858. “London Stone, Cannon Street.” Notes and Queries 2nd Series Vol.5. Most prominently quoted, as here, in; (Ackroyd 2001, 18) but traced by John Clark as a mischievous fabrication by Welsh cleric Richard Williams in 1862. Transcribed by me from of a photograph of the plaque.